In 1956 President Eisenhower signed a law that made “In God We Trust” the nation’s official motto. Two years prior he successfully sought to add “under God” to the country’s “Pledge of Allegiance.” Today, despite fervent efforts to completely separate church and state in America, reverence to God is still seen on our printed money, coins, and some state flags. Lately, however, you may have seen the motto cropping up in an unfamiliar place: on the back of police cars. “In recent months, dozens of Southern and Midwestern law enforcement agencies have added the axiom to squad cars, usually to the vexation of vocal, often distant critics, and at the personal expense of sheriffs, police chiefs or rank-and-file employees,” The New York Times reports. 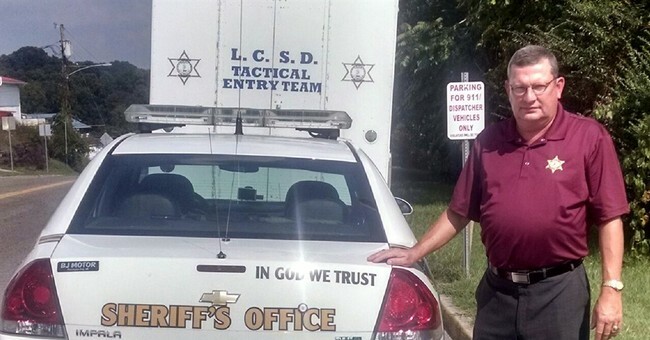 “If it’s on my money and it’s on the state flag, I can put it on a patrol car,” said Sheriff Johnny Moats, who encouraged sheriffs in Georgia this year to promote the motto’s placement on their official vehicles. “Just about every single day, I have another sheriff calling and saying, ‘I’ve done it’ or ‘Can you send me a picture of your patrol car?’"
Some officials contend that their display of the motto is elementary patriotism, a four-word way of “standing up for America, standing up for our country,” Sheriff Moats said. Others in law enforcement say the stickers are a response to the battering their profession’s reputation has taken after more than a year of high-profile killings and extraordinary scrutiny. But critics, like the organization Freedom From Religious Foundation, argue they shouldn’t be allowed on government vehicles, despite the fact that the courts have repeatedly dismissed challenges to the motto. "We are getting a lot of concern from non-believers in these smaller communities, where they feel they will be targeted," the group’s Co-President Annie Laurie Gaylor told Fox7. "These sheriffs and police think they take guidance from God instead of our civil law and that's scary." Childress Police Chief Adrian Garcia was unfazed by critics, however.